The reboot of Star Wars Battlefront was long-overdue. The 2015 title looked gorgeous, though as with most things there remained some room for improvement in the gameplay department. 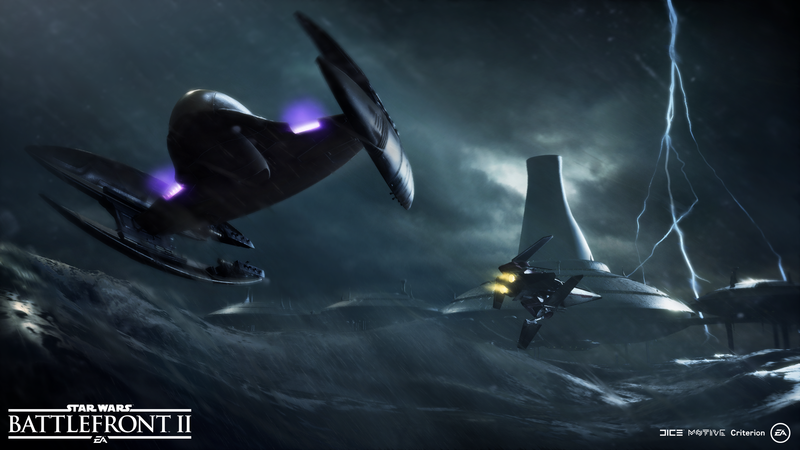 EA DICE has been hard at work not only supporting the existing game with updated content, but also in developing a sequel, the simply-titled Star Wars Battlefront II. We were able to go hands-on with a PC build of the multiplayer mode of the game while attending EA’s PLAY event prior to E3 2017, and have our impressions below. If there was one thing that was sorely lacking in the previous game, it was class-based characters. DICE heard player feedback loud and clear, and have brought in several different classes to play as. During our session we were shown the Assault, Heavy, Officer, and Specialist classes. The Assault class is a standard-issue soldier. You have a blaster rifle, two types of explosives, and a charged-up special which enhances your damage. The Heavy class is what you’d expect – a heavy-firepower, heavily-armored suppressive firing soldier who can provide cover fire for others attempting to grab an objective. The Specialist class is more long-ranged, good at picking off distant targets. Finally, the Officer may not have much in the way of armor, but they can boost morale of surrounding troops, providing boons and battle points to those around them. Save Points or Cash In? Earn enough Battle Points, and you can unlock access to vehicles and other special classes of characters. This includes the hero/villians such as Rey, Darth Maul, Boba Fett, Han Solo…the list goes on, and includes characters from all eras of the Star Wars universe. The hero/villians are very expensive in terms of battle points. So you have to decide if you’re going to use your points for vehicles, or save up and cash in for a hero closer to the end of the match. This is in stark contrast to the previous game, which used randomly-generated tokens to give everyone a random but fair chance at nabbing a vehicle. The new battle points system remains fair, though, because the game actively gives you points for almost any action you perform. The game will often spawn you placed into a squad. It encourages squad play by rewarding you with extra points if you stay near your squad mates. Even simply damaging an enemy will net you some points; kills or assists are worth more, naturally. I saw a few lives where I earned thousands of points, but unfortunately our match was over before I could test out a hero character. Still, the new unlock system work much better than any sort of streak system, and is worlds better than leaving unlocks to icon pickups as in the previous game. Gunplay also felt better than in Star Wars Battlefront II. You can use iron sights, for starters, something many players felt was removed unnecessarily in the last game. Projectile weapons also offer recoil, adding to the skill required to perform well. Energy-based weapons can overheat, and have a cooldown mechanic. If you reload and then press the fire button at the right time, you’ll reload more quickly (active reload). Press at an incorrect time, however, and you’ll have to wait even longer for your reload to finish, costing you valuable time and perhaps your life. As you have no doubt seen by now, Star Wars Battlefront II looks phenomenal. Whether it’s reflections off a Stormtrooper’s suit, puddles of water on Theed, blaster fire, or explosions, the game almost looks like it was ripped straight out of a Star Wars movie. Audio is also impeccable, and intense firefights echo throughout the battlefield. We were playing on a good set of Logitech headphones, and felt especially wrapped up in the action, the noise of EA PLAY falling to the wayside as our focus turned to the action onscreen. We have much more information coming your way soon regarding not only Star Wars Battlefront II’s multiplayer plans, but also hands-on impressions from the single player campaign, and an interview with DICE regarding everything that’s new with the sequel. Star Wars Battlefront II is currently slated for launch on November 17 for the PlayStation 4, Windows, and Xbox platforms.